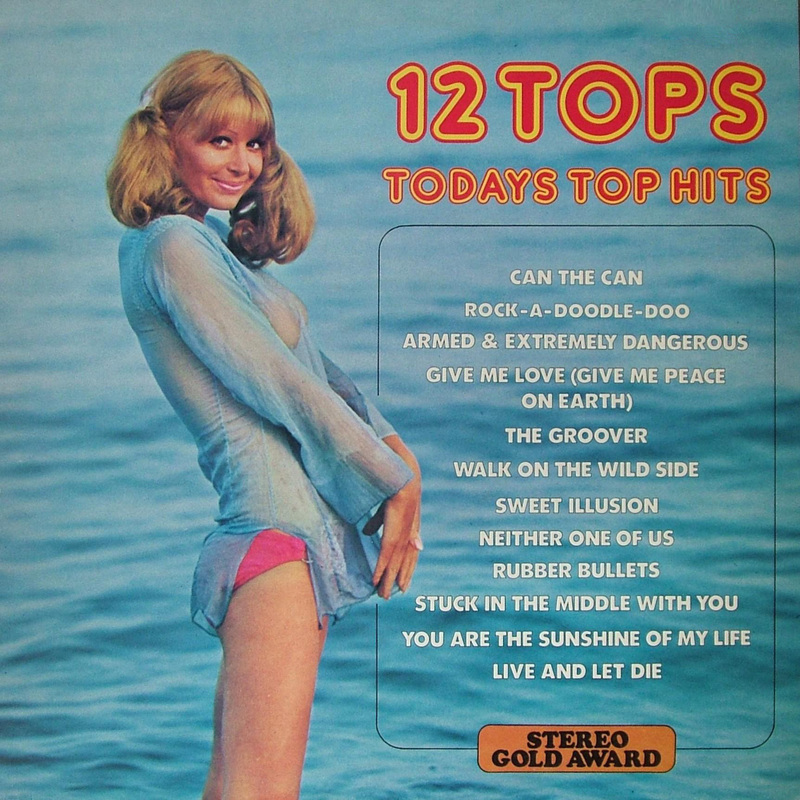 These albums were issued on the Stereo Gold Award label, which began life in (circa) 1969, courtesy of David Leonard ("DL") Miller, along with Monty Presky, formerly a director of Pye. Both are pioneers in the budget records field. 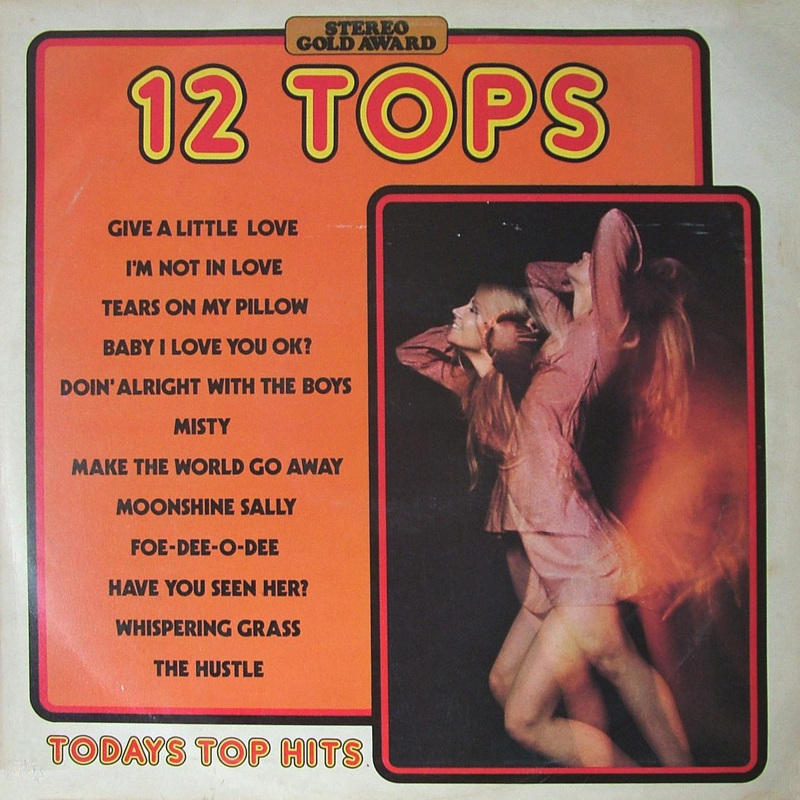 The first relevant releases were the two “Chartoppers” LPs of 1970, which act as precursors to "12 Tops". 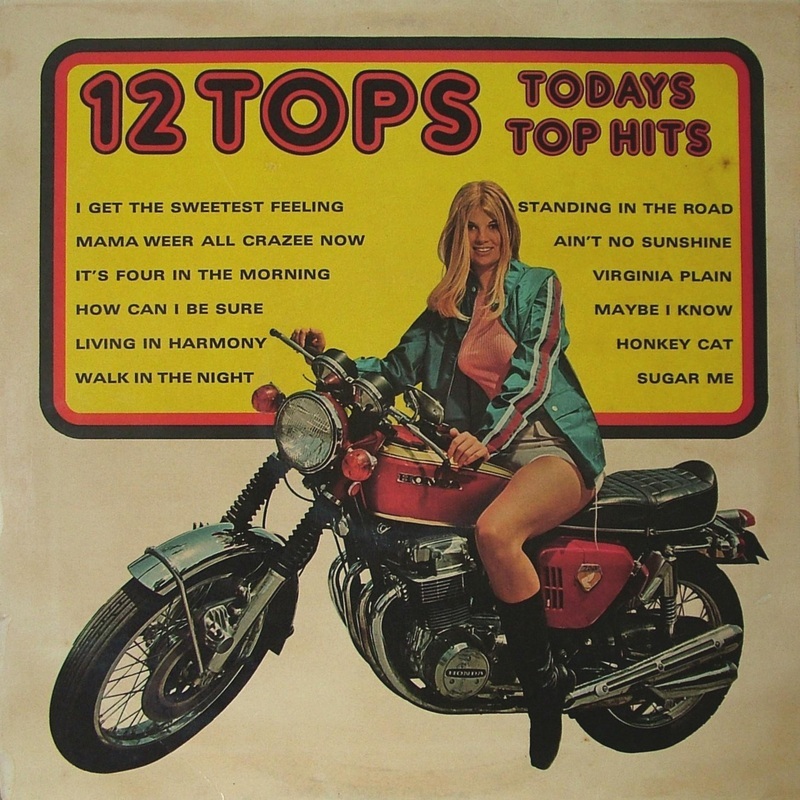 Eighteen months passed before “12 Tops” was properly unveiled, and it went on to become one of the most prolific covers series ever – with some 30 instalments, usually at monthly intervals. 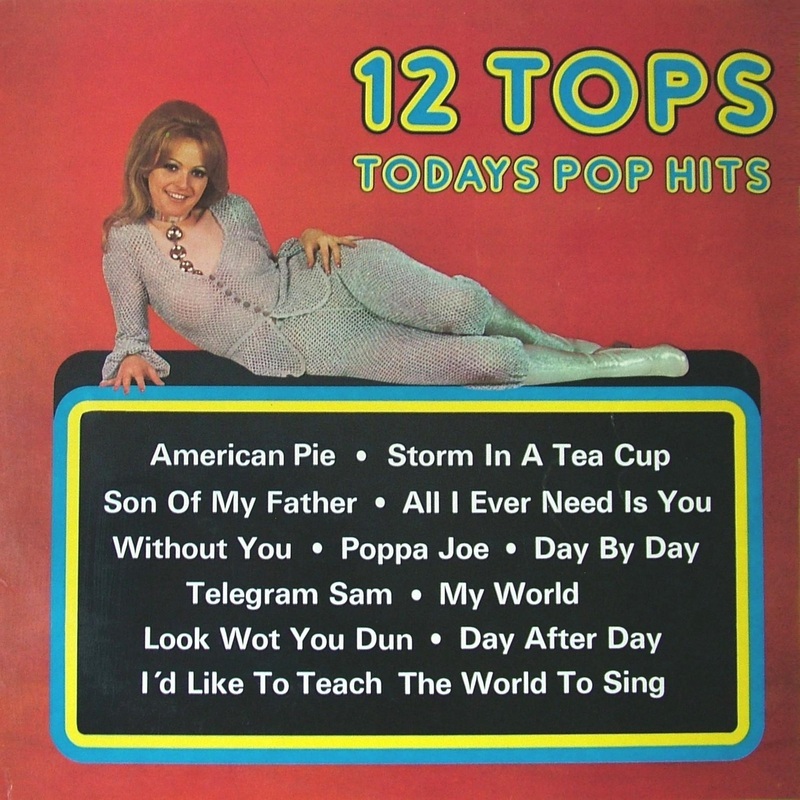 Many of the recordings on “12 Tops” crop up elsewhere – for example, the whole of volume 25 may be heard on “Pye Chartbusters volume 13”. Early on, the contents of the albums were supplied by Coombe Music, who also supplied several other labels, accounting for the cross-overs. But in due course, Miller and Presky created their own Damont Records, who supplied Stereo Gold Award with recordings for some time, until late on, when tracks were sourced from elsewhere again – this time by Beatt International. 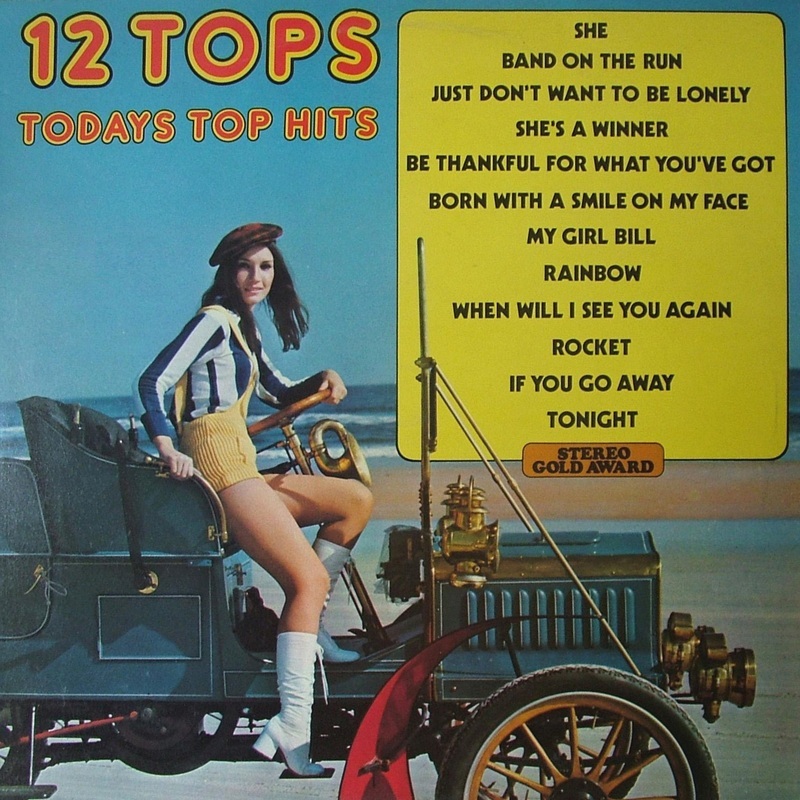 In a few cases, Damont Records directly issued albums from the "12 Tops" series on cassette and 8-track cartridge (see below) - although the extent of these tape editions is not really known at present. 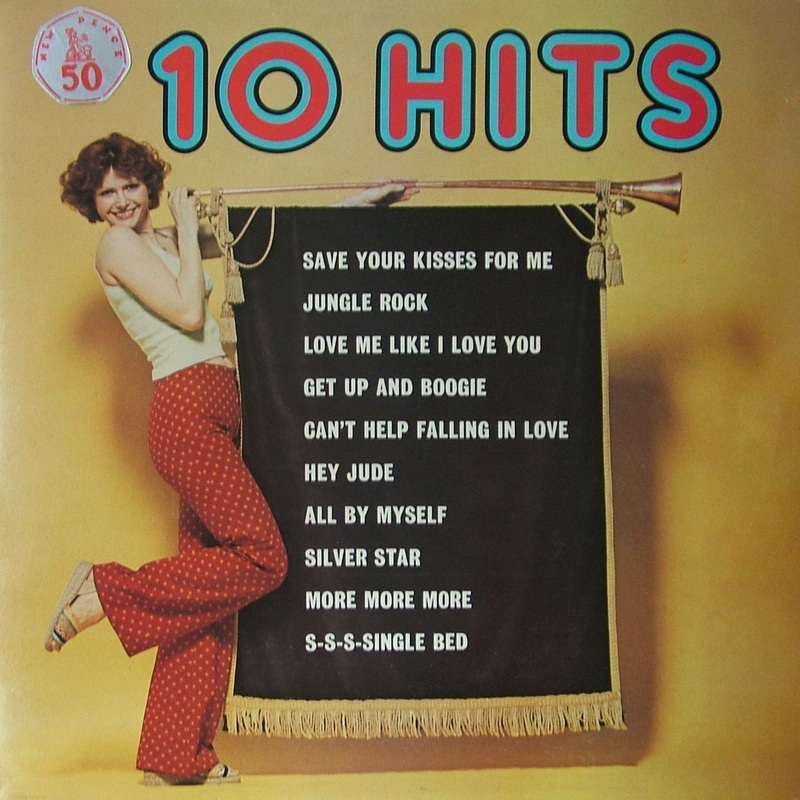 In addition to the main LPs, there was a short run of US editions with different songs. 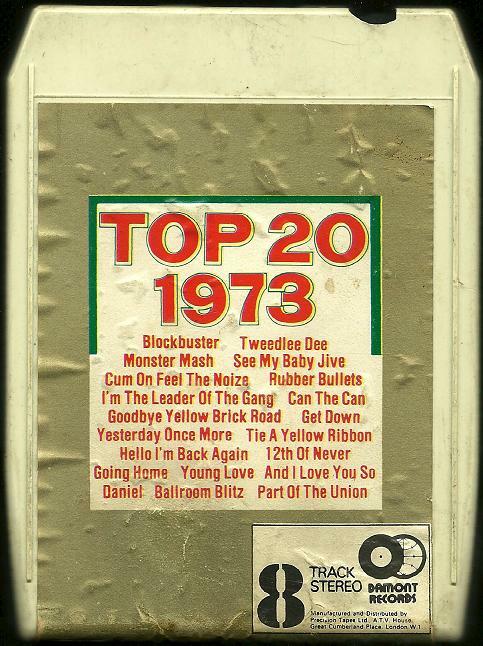 Stereo Gold Award was active until the late 1970s and had an exclusive arrangement with Woolworth’s for high-street sales. 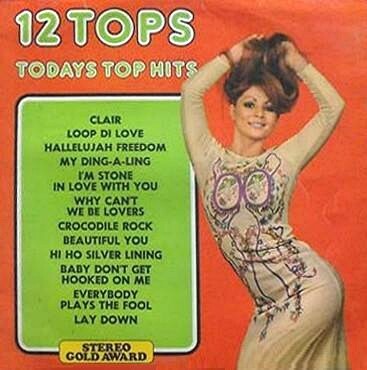 The first albums of this type to be released on Stereo Gold Award appeared over the summer of 1970, and were called "Chartoppers". Elton John appears on the first of these. 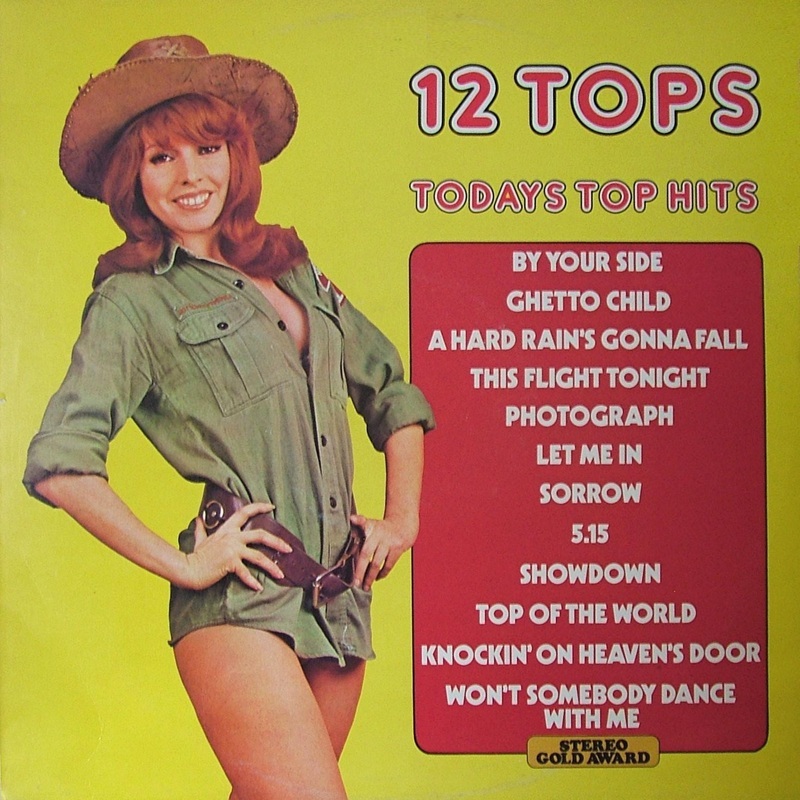 The second and last one duplicated three tracks from the first, and not all the hits were current - indicating that the label was not too committed to the format at that point. Comments: Cover model is Marilyn Ward, Miss United Kingdom winner in 1971. The image was taken by photographer Paul Chave. This was also released by Damont Records on cassette (ZCDAM 357). 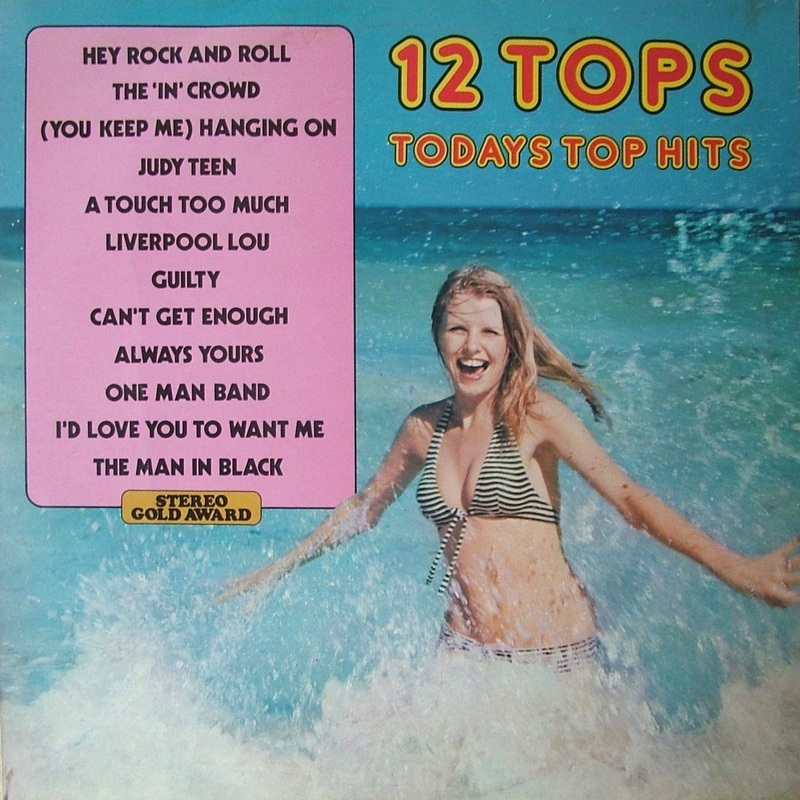 Comments: Sleeve notes state "Your 12 Tops of the month", confirming the start of a regular monthly schedule. School's Out / Where Is The Love / Too Busy Thinking 'Bout My Baby / Seaside Shuffle / Conquistador / 10538 Overture / Run To Me / My Guy / Lean On Me / Popcorn / You Wear It Well / Theme From "The Godfather"
Comments: Stereo Gold Award introduced a new catalogue numbering system specifically for this series, starting here with MER 100. Comments: Album is mis-titled as volume 6. Cover model is Penny Irving. 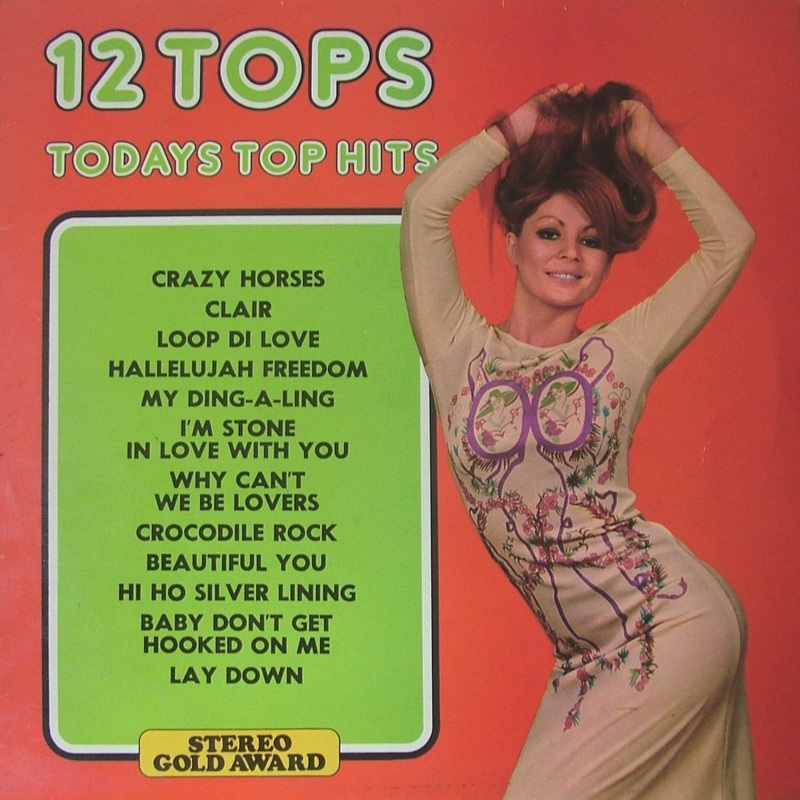 Comments: Album is mis-titled as volume 6, and is a re-issue of MER 103, with a track change – “Everybody Plays The Fool” is replaced by “Crazy Horses” (which appears top of the list on the revised version of the front cover). The catalogue number has an X added to differentiate it from the first edition. Cover model is Penny Irving. Comments: The track listed on the cover as “Tweedle Dum” is of course “Tweedle Dee”! 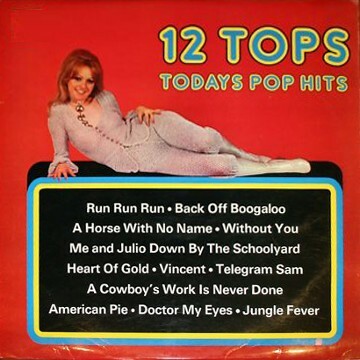 "Doctor My Eyes" is a different recording to the earlier version on the American edition 1 (see below); this one imitates the Jackson 5, whereas the previous recording imitates Jackson Browne. Comments: Cover star is Penny Irving (see also volume 7). Comments: Cover model is Ingrid Steeger. 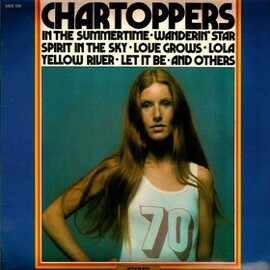 This was also released as an 8-track cartridge (Y8 DAM 900) on the Damont Records label. It is known to exist in both white and green plastic shells. The album was also released by Damont Records on cassette (ZCDAM 900). The crowd noises at the start of "Teenage Rampage" are sampled from The Sweet's original hit single! Comments: This was also released as an 8-track cartridge (Y8 DAM 901). It is known to exist in both white and green plastic shells. 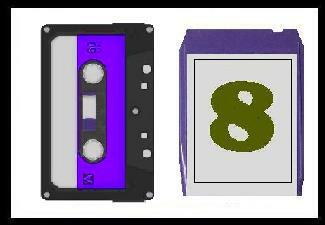 The album was also released by Damont Records on cassette (ZCDAM 901). Comments: Contents are identical to “Parade of Pops vol 16”. Comments: Contents are identical to “Parade of Pops” LP WPP 5019, and “Pye Chartbusters vol 13”. Comments: This 10-track LP was an attempt to sustain the series (albeit with a tweaked title) after a considerable gap, but turned out to be a one-off. It was retailed at 50p, with a coin-shaped price sticker on the front. 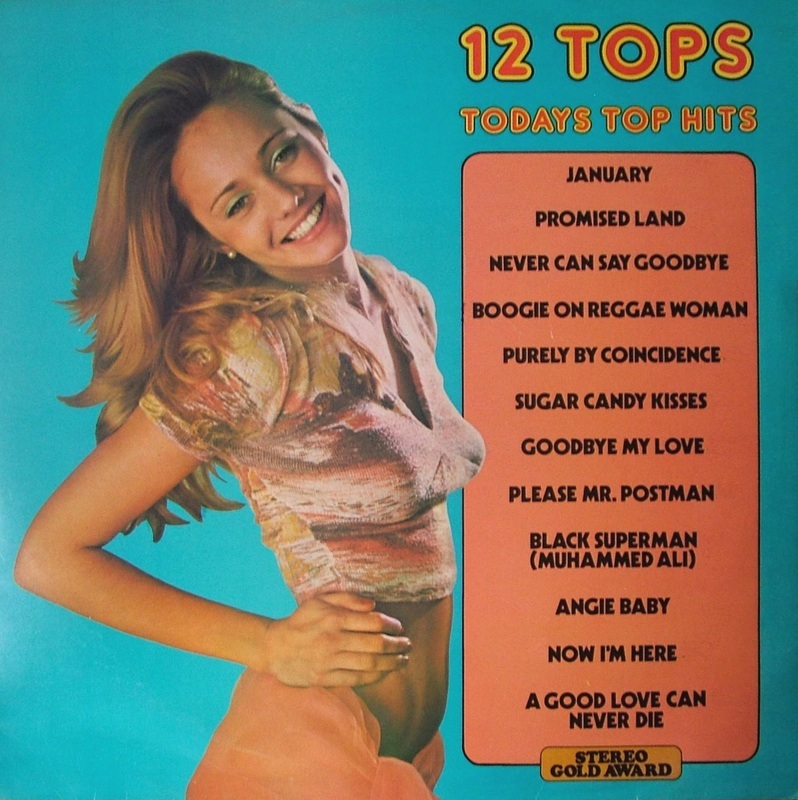 No standard end-of-year round-ups are known from the otherwise prolific "12 Tops" series. However we have discovered that at least one such collection exists on the 8-track cartridge format. 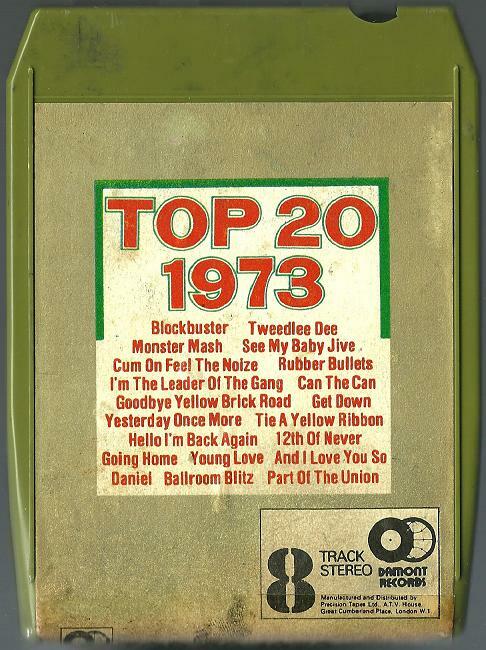 It dates to 1973, and although a few other 8-tracks are known from the main series (see above), they are later. This may or may not be a one-off when it comes to annual round-up colllections - we do not know. Comments: Released on 8-track cartridge, in both green and white plastic shells. Other formats not known. Contains 20 tracks from volumes 8 to 15. (Although volumes 16 and 17 were 1973, they are not sampled here, suggesting this may have appeared some time before the end of the year.) Label is Damont Records. The following albums were marketed in America. They contain selected material from the UK albums, bulked out with new recordings of songs which were American hits, making a roughly 50/50 split on each album. It will be noted that the sleeve designs are taken from the UK series. 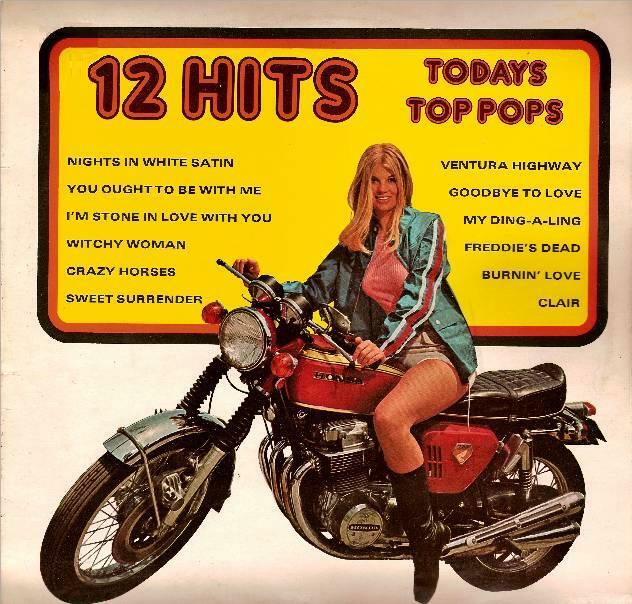 The last two are called "12 Hits".